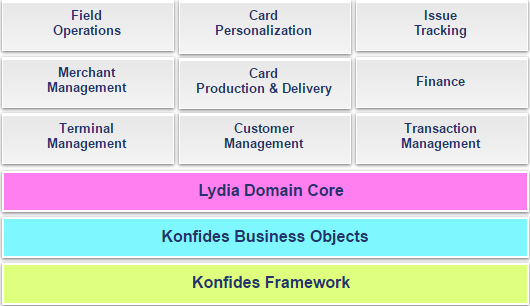 Konfides Lydia is a payment application suite mainly targeted for prepaid corporate service providers running employee benefit, gift and social programs. These applications generally work in closed-loops. Lydia has been designed to be the sole software used for all business processes from card production/personalization to field operation, POS application to security components. It is highly modular and capable of being integrated to customers’ existing infrastructure while providing a complete customizable end-to-end solution. Lydia could be adapted to different markets and scalable to various organizations ranging from smaller operators to global providers. Managing cash or non-cash employee benefits imposed by regulation or work environment/culture, is one of the major competencies of Lydia. Flexible revenue management models (commission from merchant, service fee from customer), comprehensive spending controls, offline operation option, point or currency based benefit modelling are critical features to be envisioned when running benefit programs for meal/food, healthcare, childcare or similar. These programs are quite popular in Latin America and Europe. Lydia could be used in gift card programs where the customer is a corporation and the cardholder has no direct financial relation with the merchant and cards are bought/used by the cardholder. Public Social Programs are similar to employee benefits in many ways. Financial processes and revenue models are different than employee benefits. Spending limits, point or currency based purchase options are often needed by program operators and organizations.ir. Lydia was designed and developed to be the primary business application for prepaid service providers and program managers which is like employee benefits, incentive and reward, gift card and public social programs. Public institutions (municipalities, transport operators) and NGOs who are running their own programs with or without merchant interaction; can use Lydia in their operations. Adaptation of validators or other types of terminals is a straightforward process with Lydia’s standard interface protocols. Lydia will also provide flexibility and freedom of choice for beneficiaries and ease of control and transparency for the organization. In environments where cash&funds management capabilities of banks are required but specific business flows and closed loop payment system implementations are crucial for the customer, banks could utilise revenue from key accounts where they can differentiate with a non-standart solution. Co-branding of a private payment scheme on EMV cards with Java technology creates a good opportunity. Lydia could be used by operators to manage and run their own card programs or run a program on behalf of their customers. Transaction Management module includes external interface and routines for communication of Back Office and 3rd party services. It is responsible for collection and verification of online and offline transaction batches and distribution of refined data to related modules. Contracts with customers, commercial conditions of contracts and other customer specific details like invoicing, card delivery rules are managed in this module. Depending on the business model of program, Cardholder Management might have a connection for corporate cardholders or direct management of cardholder. Contracts with merchants, commercial conditions of contracts and other merchant specific details like invoicing rules are managed in this module. Terminal definitions of merchants and operational parameters related to physical terminals installed in merchant premises. Card personalization and delivery of the personalized cards within an organization is a very detailed process. Grouping personalization batches and printing delivery notes for courier and customer is a major issue of operations team. Starting with the purchase of the terminals; installation to the merchant, remote software download management, terminal tracking within the operation and all the other terminal related operational procedures are controlled by this module. This module provides interfaces for helpdesk personnel which are specialized to keep track of the questions, problems from customers, merchants and card holders.